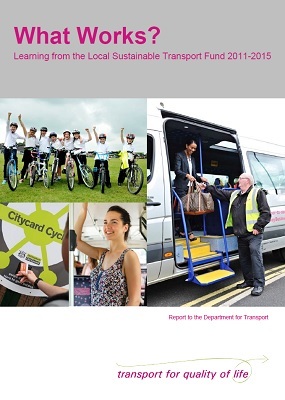 Findings from all the evaluations, case studies and reports from the 2011-2015 £600m Local Sustainable Transport Fund programme are combined and reviewed in this report. Headline successes emerging from the 12 Large Projects that were the focus of most evaluation include: 2.3%-point reduction in per capita traffic volumes compared with comparator authorities; 6.6 %-point increase in cycling compared with comparator authorities; 2.2 %-point decrease in carbon dioxide emissions compared to comparator authorities. The twelve 'Large Projects' that received more than £5m each from the 2011-2015 £600m Local Sustainable Transport Fund monitored and evaluated their activities. This report considers in detail the evidence collected, covering, inter alia, reductions in vehicle use, increases in cycling and reductions in carbon dioxide. This report compiles lessons from the Department for Transport’s four year £600m programme of investment in sustainable transport in England. It draws on structured discussions with the local authority practitioners who implemented the Local Sustainable Transport Fund to learn how future similar activities should be undertaken, considering both local project and national programme levels. It looks at what worked, what didn’t, and how difficulties were overcome. The report also summarises the major activities and themes of the Fund. It is an essential resource for council officers, councillors, Local Enterprise Partnerships and national programme managers implementing initiatives to improve and promote sustainable travel, including the DfT Access Fund. Transport for Quality of Life led a major study for the Department for Transport to evaluate the effects of large-scale Smarter Choice Programmes in the Sustainable Travel Towns. This work gathered together and analysed in depth a large body of data, in order to evaluate the effect on car use and travel by other modes, and to understand the likely impacts on carbon emissions, congestion and physical activity resulting from a significant boost to investment in smart measures. Analysis of trips within the towns and their surrounding sub-regions showed that car driver trips fell by 9% and car driver mileage fell by 5-7%. Recommendations are made regarding how the levels of travel behaviour change recorded in these towns could be replicated and enhanced elsewhere. to reducing carbon dioxide emissions, and the policy package necessary to make the most of these measures. It found that smart measures offer a highly cost-effective way of reducing carbon emissions, compared to other methods. The findings contributed to the Government’s UK Climate Change Programme. Transport for Quality of Life worked with MRC McLean Hazel on a project to design smarter choice packages for residents of new housing developments in Northamptonshire. The project examined which of a variety of ‘smart’ options for receiving information were most attractive to residents. This project compiled a good practice guide to promote travel planning in the corporate sector. The Essential Guide to Travel Planning draws together tried and tested experience of businesses with travel plans already in operation, offering a lively and informative overview of what you need to prepare a travel plan and get it up and running. Funded by Department for Transport (2008). This work presented talks and ran discussion sessions with focus groups in four UK cities with the aim to motivate participants to use their cars less and to inform them about the possible options available to them. ‘Smart’ transport measures such as workplace travel plans and personalised travel plans have great potential to reduce car use. This study evaluated the contribution that smart measures could make under different policy scenarios. It found that intensive implementation of smart measures could cut peak-time urban traffic by up to a fifth, with lower but still significant cuts in non-urban areas. The research played an influential role in the review of the Government’s 10 year transport plan, and has encouraged local authorities to develop their ‘smart choice’ work. This overview of travel planning measures describes the individual tools used in travel planning, how they can be put together in a package, and how much change a local authority can achieve at site level and across an entire town. Most schools that become involved in school travel planning are successful in cutting car use. Reductions of around 20% are quite common, and some schools achieve more than this. This research project involved 30 in-depth case studies of successful school travel plans, and evaluated what factors were most important in determining their success. This report deals with local transport schemes, such as bus improvements, travel plans and better cycling facilities. It looks at whether they could help cut traffic, and how much. Until recently, it was accepted wisdom that the impact of these measures on car travel was at best marginal, and that once any benefit was eroded through induced traffic the net effect on traffic volumes and congestion was negligible. Less Traffic where People Live challenged the accepted wisdom, suggesting local transport schemes could potentially cut traffic by as much as a third in urban areas. Its findings prompted the Department for Transport to commission the Smarter Choices research. Encouraging behavioural change through marketing and management: what can be achieved? This paper summarises the potential effect on car use of intensive application of workplace and school travel plans, personal travel planning, bus information and marketing, and car clubs.